For parts of four decades the Catholic state tournament was an important part of the basketball landscape in South Dakota. The first tournament was held in 1937. The last was in 1964 and Steve Jansa made sure that Sioux Falls O’Gorman High School went out a winner. There were 11 teams in the final tournament at the Sioux Falls Coliseum. Jansa, a standout senior, powered O’Gorman to the championship. The Knights defeated Mitchell Notre Dame 54-50 in the finals. With that victory O’Gorman ended the season 14-9. The previous year the Knights had went 16-5 and finished as runner-up in the tournament. The championship in 1964 was the 12th state Catholic title claimed by Sioux Falls (O’Gorman had previously competed as Sioux Falls Cathedral). Jansa was also a talented hurdler in track for the Knights. In basketball he was a dominant force offensively and defensively for Coach Mel Klein. He totaled 781 points during his final two seasons and averaged 22 per game as a senior. 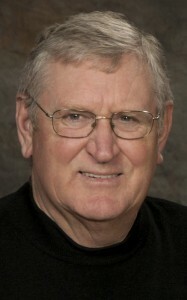 He was named to the all-Catholic team and also was selected to the Class A all-state team in the 1963 and 1964 seasons. Leaving the Knights for competition in the Missouri Valley Conference, the 6-foot-7 Jansa was a valuable forward playing for Creighton University. The Bluejays were coached by John “Red” McManus. Jansa saw action in 75 career games for Creighton and totaled 427 points and 322 rebounds. Jansa has been a championship-level golfer in the South Dakota amateur ranks. His state titles include the Pre-Senior Tournament in 1986, the Senior Tournament in 2002, the Senior Two-Man Tournament in 2004 and the Adult-Junior Tournament in 2008. He will be enshrined in the South Dakota Golf Association Hall of Fame later in 2016. Jansa and his wife Pam live in Sioux Falls. Children are Erin and Ryan. Ryan is a decorated golfer who holds the record for most SDGA titles.